An unusually competitive primary election cycle — containing hotly contested races for everything from county supervisor to superior court judge — has come to an end. 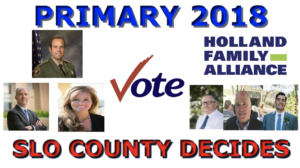 Will the family of deceased SLO County Jail inmate Andrew Holland succeed in ousting conservative incumbents from high-ranking offices in San Luis Obispo County? Will the incumbents overcome bad press and a groundswell of opposition and reclaim their elected offices? What about the local judicial races? Also, what has unfolded in the statewide campaigns, including the race to be California’s next governor, as well as the Democrats bid to use California to propel them to a takeover of the House of Representatives? It is time for 2018 California primary election results. CalCoastNews is providing live updates. Stay tuned. And feel free to comment as the results come in. 8:20 Prior to polls closing, the Los Angeles County Registrar-Recorder announced that more than 118,000 voters’ names were left off the voter roll. The error was being corrected via the distribution of provisional ballots. But it could delay the vote count in California’s largest county. 8:27 Initial governor’s races results — With 2.1 percent of statewide precincts reporting, frontrunner Gavin Newsom is indeed out in front of the pack with 36.9 percent of the vote. Newsom is trailed by John Cox (25.8 percent), Travis Allen (12.2 percent) and Antonio Villaraigosa (10.7 percent). Pundits have dubbed the primary election for governor a race for second place. It appears Trump-endorsed Republican John Cox had a solid chance at making it to the runoff against Gavin Newsom, California’s lieutenant governor. 8:35 Onto SLO County. First tally. Vote by mail ballots are counted. 8:41 If these numbers hold, Parkinson and Dow will both easily survive the massive challenges mounted against them by the Holland family and local progressives. Incumbent Supervisor Compton appears to be in a dogfight for the District 4 seat. If the initial results hold up in the District 2 race, Gibson will win outright and claim a 4th term on the board of supervisors. It does not look like the infamous local defense attorney is getting elected to the bench. It appears the recently appointed Baltodano is on track to keep his seat on the bench. Challenger or no challenger, Bordonaro appears poised to win another election. 9:30 As we wait for the next batch of SLO County results, it appears incumbents have commanding leads in each of the key county races, with the exception of District 4 Supervisor, in which Compton is neck and neck with Paulding. 9:52 Parkinson, Dow and Gibson remain comfortably ahead, with Gibson on pace to win his three-way race outright in the primary. Bordonaro, Baltodano and Covello each, as well, have big leads. All six of these candidates appear poised to claim their respective seats. 9:57 In the governor’s race it is looking very likely it will be Newsom and Cox (the Trump-backed Republican) in the runoff. With 16.6% reporting, Newsom is at 34.0% and Cox is at 26.8%. Villaraigosa and Allen are tied in a distant third with 11.1%. Now, what is the measure? The initiative will impose a tax on the gross receipts of most marijuana businesses in unincorporated areas of the county. The initial tax rate will be 4%, and it can be raised up to 10%. 11:27 With 20 of 29 (68.97%) percent of precincts reporting, the race has flipped. 11:37 Recapping things elsewhere in SLO County, incumbents Parkinson, Dow, Bordonaro and Baltodano are each cruising to victory with more than 60% of the vote. Incumbent Gibson is cruising to victory with just under 59 % of the vote, despite being faced with two challengers. In the judicial race between two well-known newcomers, Covello is easily defeating Funke-Bilu by a tally of about 65%-35%. 11:41 Based on the swing in District 4, Gibson could emerge from Election Day as the big winner. He is avoiding a runoff election in his own race, and now if Paulding can upset Compton, Gibson will be slated to recapture the board majority. 11:47 With a boost from President Trump’s tweets, John Cox will move into the runoff election for governor with frontrunner Gavin Newsom. With nearly half of the statewide precincts reporting, Newsom has captured about 34% of the vote and Cox about 26%. 11:58 Politico is reporting that currently the Democrats are placing at least one candidate in most of the Republican-held House districts won by Hillary Clinton in 2016. However, several of these key races remain two close to call, with there still being a possibility that two Republicans will move on to the runoff. In Rohrabacher’s 48th District, a Democrat currently has a narrow lead over a Republican for second place. 12:03 After midnight in election headquarters. Still awaiting updated results from SLO County. All eyes still on District 4. 12:14 Results… and yet another reversal! With all precincts reporting, Lynn Compton leads Jimmy Paulding by 83 votes, 6,092 to 6,009. A total of 6 ballots remain unresolved in the District 4 race. 12:34 The results are not final. More mail-in ballots must still be counted. But, with all precincts reporting, Compton leads Paulding by 83 votes. That is how election night wraps up. 12:40 Albeit this is not the final tally, SLO County’s election turnout was low. 56,260 of 166,592 registered voters (33.77%) voted in the primary, according to the final election night results. I see the results for Fridays count puts little jimmy within 39 votes of Lynn lets hope it doesn’t get to be 39 over, there is still more to count. I see the voters in dist 2 have stayed stupid and we’re now stuck with gibson again, lets keep our fingers crossed that Compton wins and not jimmy or we’ll really be up a creek with out a paddle. Thanks CCN for the updates. Aye-Caramba, you’re right. SLO has some real problems not limited to your comment. Sad to know so many registered voters and such a low turn-out. The county deserves what it gets. As predicted, incumbents re-elected…and the “Progressives” defeated at the ballot box. The adults in the Democrat Party need to re-enter the room again if they do not want to see more of the same. San Luis Obispo City is next. Harmon must go. Her “marxist” wannabe image with large fake hair flowers and red berets seem clown-like in caricature. She listens to few and spouts utopian rhetoric. That’s fine for Linnea’s Cafe, but in the REAL world, SLO City is in serious trouble. I’m a true progressive and seek those who represent the citizens instead of powerful special interests. I agree, HH must go. I urge all true believers in democracy to flock to Keith Gurnee’s campaign to unseat this unpopular mayor. We need a person of the people, she fooled us once and then stabbed us in the back. Wow! Excellent reporting. Thanks for keeping SLO County in the loop! No other press outlet even came close to your effort.